I hope you are all enjoying Meg's new collection, French Roses. My card today features two beautiful images from the Cut & Create pages included within the collection. 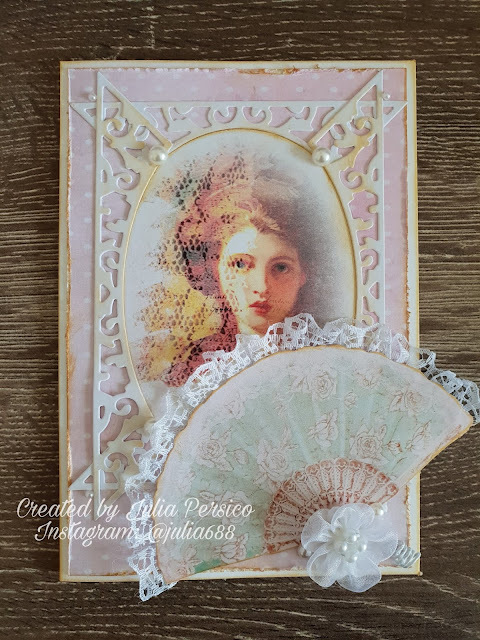 With lace a printed layering feature over the young lady image, I used lace from Meg's shop, gathered, and placed around the Cut & Create fan, adding texture and making an embellishment that coordinates and compliments at the same time. Wanting to keep her mystique, I placed the fan slightly over her face, almost as if she were holding it. 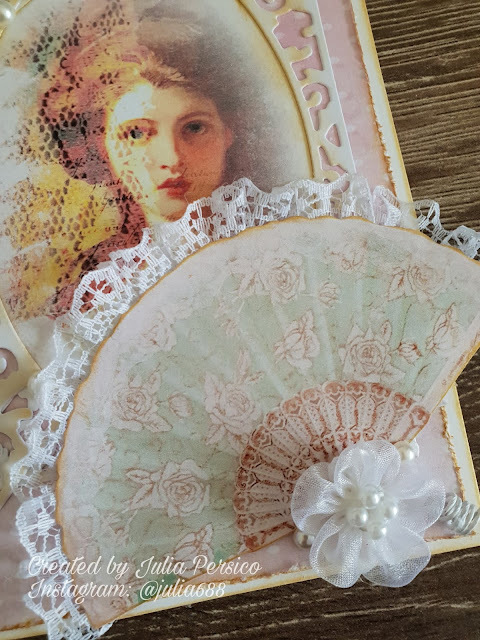 I kept the background simple, using another paper from the French Roses collection. From a border die,I cut several edges and overlapped them creating a different style border again, to accentuate and frame the lovely lady image. Peal bling, and a fabric flower finish the card off, making it perfect for any occasion and recipient. The beautiful colouring that features in French Roses makes it easy to coordinate suitable embellishments and enhance the imagery. Have fun creating, there's always something new in Meg's Garden to inspire you! Gorgeous Julie,i love the addition of the lace trimmed fan!.